June 19-22: Arthur Carhartt Wilderness Training. June 25—28: Cabin Creek Base Camp with Day Rides out of Camp; spectacular wildlife viewing, short or long rides, hiking and relaxing. July 3-6: Cabin Creek Base Camp; early fishing trip on the North Fork of the Sun. July 8-11: Cabin Creek Base Camp Couples Trip; fishing and/or horseback riding in the Wilderness. July 17-21: Cabin Creek Intimate Trip (only six guests); fishing and/or horseback riding in the Wilderness. July 23-28: Roving Continental Divide Trip. July 31-August 5: Roving North Chinese Wall Trip. August 20-23: Cabin Creek Camp Trip. August 20-25: Quick Roving Wall Trip. Our camp is easy to access, feel free to call and we can adjust dates to accommodate personal schedules. Call for details or to book your slot! Camping does not mean you have to rough it completely. Join us for a back country family experience and let us do the cooking and clean-up. Relax at Cabin Creek, our main camp in the Bob Marshall Wilderness (18 miles from the lodge - approximately six hours by horseback). Enjoy great pristine fly fishing, scenic day rides from the camp, fabulous campfire meals and super photography possibilities. 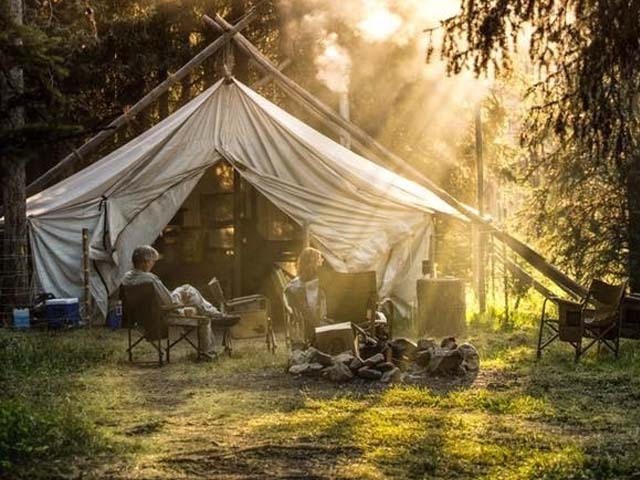 A perfect camp for a family vacation. A cabin will be provided at the Lodge the night prior to your back country pack trip departure. Experience the famous 'Chinese Wall'. This is a lot of riding and is not recommended for kids under 12. It makes a memorable couples trip. This trip may be custom arranged to accommodate your pleasures.This is a once in a lifetime experience that will never be forgotten. 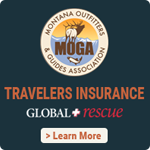 Those travelers that are more independent and adventuresome may choose to have us drop them and their equipment at a designated location. This allows the outdoorsmen and women to experience the Bob Marshall and explore all it has to offer on their own. At the time of the drop, a specified time and date will be agreed upon for the client and equipment to be picked up. You may ride a horse in to the campsite, saving your legs to explore once there, or hike in free of your gear. If staying longterm, ask us about our re-supplying service. We charge $300 for the packer/guide and $150 for each pack animal (riding horse or pack mule) for both the trip in and the trip out. We pack 120-140 pounds per mule. A general rule is to plan on one mule for each person. Please call or email to check for date availability and location recommendations. 50% deposit is required to confirm your reserved dates. Book a group of 6-8 guests and pay $350 per person per day!